I saw these fruits on TV and after a bit of searching (didn’t think to look for the growers website!) found some at James St Market in Brisbane. At over $17 per kilo, they work out at about .90 cents each, which is expensive for the size of the fruit. So what are Achacha’s? They are a new fruit in Australia, originally from Bolivia in South America. The Australian fruit are grown on a large plantation (the worlds largest?) south of Townsville in North Queensland. 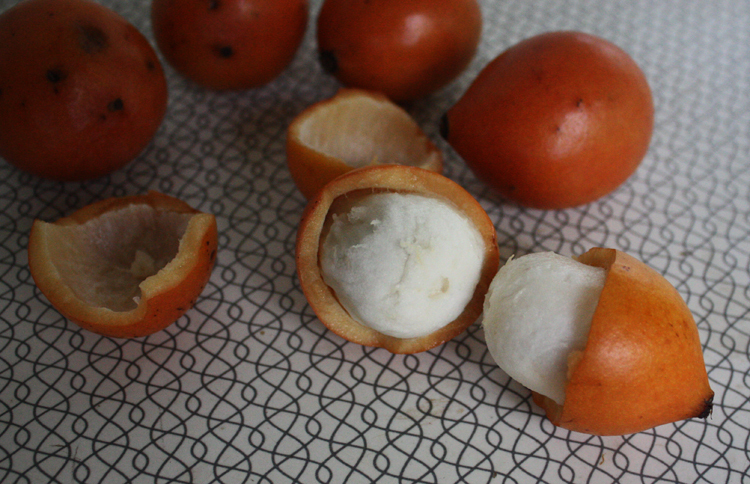 Some time ago I tried a mangosteen which is closely related to the Achacha. The mangosteen is meant to be the Queen of Fruit, but I was quite disappointed with it. Not so with the Achacha, the fresh white flesh inside the orange skin is tangy, sweet but slightly acid and is delicious. Unfortunately with the large seed there is not a lot of flesh to enjoy. This entry was posted in Fruit and tagged dessert, food, fruit. Bookmark the permalink.